Successfully Added Dual Camera HD Car DVR - HD Resolution, Backup Camera, Auto Record, Loop Record, GPS, G-Sensor to your Shopping Cart. 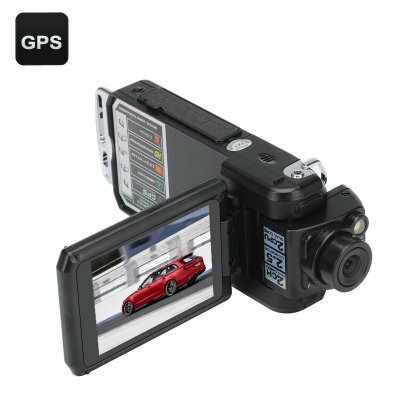 This stunning portable car DVR doubles as a hand held camcorder or sports action cam thanks to its ingenuous design and flip out view screen. When you're on the roads this all in one HD cam will record it all in stunning HD resolutions, there are even several scan selections to help capture the prefect quality shots no matter the lighting conditions. With both front and rearview camera this car DVR can chow you what's happening all around the vehicle as and will also aid you when it comes to reverse parking. Its quick and easy to install in any car and has the addition of GPS so you can add location details to your recordings. When it comes to road safety this car DVR is your first line of defense against scammers and fraudulent claims. The insurance industry are keener than ever for you to protect yourselves as fictions claimants' are costing the industry millions and causing insurance price to sky rocket year on year. With its strong suction cup this car DVR can be mounted on your dashboard or windshield and its wide angle 120 degree lens allows it to capture the full road in front. You don't even have to remember to turn it on as the auto ignition recording means it will detect when a current is running to it from the lighter socket and automatically start recording making life quick and easy. Using a 1/4 inch CMOS sensor this car DVR delivers HD resolutions at 30 frames per second and the auto white balance helps get the perfect exposure so you have great footage each and every time. A flip out 2.5 inch TFT screen lets playback and view the recordings giving you access to indisputable proof of what events unfolded on the roads. This car DVR has a good exposure range so filming in bright light or dark conditions won't be a problem and the G-sensor ensures you won't record over important data. This car DVR and camcorder comes with a 12 months warranty, brought to you by the leader in electronic devices as well as wholesale car videos devices..